The video is shot in a bright room and shows various works, most of which could broadly be described as sculptures, and all of which involve some sort of interaction on the part of the attendees. There are flip books, a kind of elevated hopscotch game, a pair of boots attached to large brushes, and, among other things, a kinetic sculpture about which I’ll have more to say in the future. All are infused with a wonderful mischievousness. The pacing of the rough cut of the video brought to mind a metronomic pulse, which was also the subject of the “Competitive Swinging” essay. It seemed that a steady-paced work that slowly built but never got above a murmur would suit the visuals. Such music would aid in the momentum, never overpower the images, and match the clockwork motion that some of the works display. I also wanted to use a recent piece of music, so whoever ended up supplying the background tune would gain some promotional benefit. After listening through a lot of work by musicians whom I admire, and listening back through entries in this site’s Downstream department, I contacted the UK-based Grand Canonical Ensemble to inquire after “Summer Clothes,” a track off the album Saying Goodbye, which I wrote about back at the end of January. Back when I first heard “Summer Clothes,” it already had struck me as a kind of score to a movie that didn’t yet exist (I likened it to a more upbeat work by Ryuichi Sakamoto). Thanks to Salvagione’s interest and their generosity, that movie now actually exists. The video was shot and edited by Christian Schneider (of ideagarden.org), with titles by Brian Scott (of boondesign.com), the latter of whom will be familiar to Disquiet.com readers for his collaboration on such projects as Despite the Downturn; Anander Mol, Anander Veig (and its outtakes follow-up); and Our Lives in the Bush of Disquiet. Grand Canonical Ensemble consists of Josh Owen Morris and Sam Bradwell. More on them and their music at gce.tumblr.com and grandcanonicalensemble.bandcamp.com. Their third album and first ever to be released physically comes out July 18 at metersandmilesrecordings.com. It is the sound that Pete Townshend nicked from Terry Riley, a trance that cut across and through cultures. It is the sound Underworld uses to signal dramatic pause, when the dance floor is both ecstatic and still. It is the sound of dozens of key scenes from Michael Mann movies, when the city reveals itself to be the central character. It is the pulse, the place where minimalism and techno overlap. 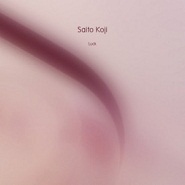 Or, in the nimble hands of Saito Koji, it is the space where minimalism leaves off, and just before techno arrives. There are three pieces on Koji’s recent free album, Luck. One, titled “Old Tape Magic,” is a lengthy drone. Another, the title track, is a kind of digital chamber music that is discernibly sweet in nature. They bookend a shorter piece, titled “Count.” The brief liner note at the releasing netlabel, restingbell.net, refers to “Count” as an interlude, but it might also be called the centerpiece (MP3). It is a slow steady pulse, and a complicated one at that. Not because of counterpoint — it lacks the rhythmic play of, say, Steve Reich. And not because of some sort of intensely demanding rigor — it is not techno by any means. No, it is its own music, derived from drone, with its centerlessness, and its lack of concern for being regarded as a song, at least by any traditional measure. It is a steady stream of pulses that shift subtly, like the way the shapes vary on each set of passing car lights on a freeway after dark. The way the tone of each pulse shifts from the preceding pulse and begins to suggest the contours of the next is endlessly enjoyable to witness. It’s hard to make pulse music that isn’t merely the sonic equivalent of op art. Perhaps “Count” really is merely an interlude between drone and melody. But we could do with more of “Count,” more playful pulses. It’s nice to imagine a near future in which someone can say that the pulse is the new drone. 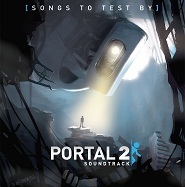 Get the full release for free download at restingbell.net. More on Koji at soundcloud.com/saitokoji. I wrote three pieces that appear in the current issue of the magazine Sactown: two brief entries in its annual best-of-the-city coverage, as well as a lengthy interview with producer/musician Charlie Peacock. Peacock is best known as a figure from the Nashville-centric world of contemporary Christian music, but he got his start in Sacramento bands that channeled electric-era Miles Davis, and he’s brought musicians like John Zorn associates Joey Baron and Marc Ribot, as well as John and Alice Coltrane’s son, Ravi, aboard for his two most recent solo albums, Love Press Ex-Curio and Arc of the Circle. Peacock’s story is a fairly intense one, not that you’d know if from his amiable demeanor. By the time the 1980s got underway, he had overcome a severe addiction to drugs and alcohol, which went hand in hand with his religious conversion. That conversion delivered him a new audience, and in time that audience delivered him to Nashville. Eventually, he came to question the orthodoxy, religious and aesthetic, that ruled the scene he had entered, to the extent that he even wrote a book about its inherent contradictions. Peacock is a great conversationalist, and the discussion he and I had — as well as the many emails we traded subsequent to our talk — made it clear the extent to which his critique of the self-containment, the self-ghetto-ization, of “contemporary Christian music” stems in large part from his admirable abhorrence of the whole concept of “genre.” In other words, issues with spiritual orthodoxy run side by side with issues of stylistic orthodoxy. It’s a heady parallel, to say the least. And the genre matter alone has applications far beyond country and pop music. Also in the Sactown issue: I had the opportunity to praise the long-running Sacramento comics store World’s Best Comics, founded and run by Dave Downey (no relation to Iron Man Robert Downey, Jr., but long ago a member of the band Pounded Clown), which was the first store to ever sell mini-comics by Adrian Tomine (whose work I edited in the music magazine Pulse!, beginning when he was in high school, and who graciously provided a quote about Downey for the article). And I wrote up the excellent podcast Phoning It In (based at phoningitin.net), which features live performances by musical acts who (you guessed it) play via a phone line. Host Elisa Hough (who runs the show from KDVS 90.3 FM, Davis, California, where I was a DJ many years back) answered some questions for the piece, and shared the following technical advice: “I try to tell artists it definitely has to be a landline with a cord. Cordless phones pick up interference. I’ve never even experimented with cellphones. That’s a no-no.”Phoning It In episodes have been occasional subjects of this site’s Downstream department. 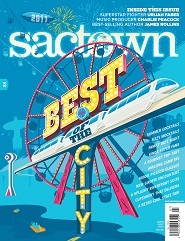 More on Sactown at sactownmag.com.